Horses are available as mounts in Skyrim, and improve your movement speed. They are somewhat slower than horses in Cyrodiil but are better at combat and have more endurance. If you fast travel to a city, then an owned horse you are riding will move to the stables outside the city; an unowned horse will return to its starting point. Only an owned horse will stay where you left it when you dismount. Horses you do not own will begin to travel back to their normal locations if you dismount them. Horses can be purchased from stables, located outside each major city. All horses have the same speed, stamina, and health, varying only in color. The only two exceptions to this are Shadowmere and Frost. Stealing horses is considered to be a crime. To steal a horse, simply mount it and start riding. Stealing a horse incurs a 50 gold bounty in that hold which stacks every time a guard notices (or is told about) you mounting a stolen horse (even if you dismount and then mount the same stolen horse). However, stealing a horse while hidden in sneak mode allows you to ride the horse without incurring a bounty. It is still considered a stolen horse, so dismounting and then mounting the horse in plain sight will incur a bounty. Note that most horses you encounter are likely to be owned by someone, even if you find the horse in the middle of the wilderness. When dismounted, owned horses will stay in the spot you left them, but stolen horses will run home. Riften Stables: A horse can be borrowed by winning a brawl with Hofgrir, or by erasing Shadr's debt with Sapphire. Katla's Farm (Solitude): Horses can be borrowed by helping Katla harvest her crops. If the owner of a horse, such as a hunter, dies by a hand other than yours, their horse becomes a free horse and you can use it without it being considered a crime. The horse will still not be owned by you and will not follow you or stay put after dismounting. The same holds true for horses stabled at forts captured during the civil war quests. There is also a random encounter which consists of a dead bandit on the ground and a horse which is free to ride. Also, most of the military camps have two horses at them; some of those horses are free to ride as well, even if you are on the opposite side from the camp (e.g. if you are a member of the Legion, the horses in the Stormcloak camps are still free to ride). Finally, most of the other unowned horses follow a walking route, with a spawning point and a final destination. When you fast travel, all unowned horses are reset to their original spawning positions; this means that if you fast travel to a location where a horse spawns, you can reliably mount that horse if you do so quickly, before the horse leaves on its route. Shadowmere has substantially more health and somewhat more stamina than a normal horse, extremely high health regeneration and a unique look. He also returns from the dead at the place where he was first obtained ten days later, if killed. He is obtained during the Dark Brotherhood quest The Cure for Madness. 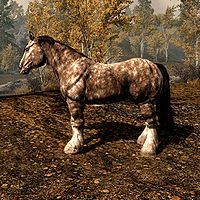 Note that to obtain this horse you must participate in the Dark Brotherhood questline—if you destroy them instead, this horse will never be available. Frost has more health and stamina than a regular horse, but is otherwise not unique. He can be obtained during the quest Promises to Keep started in Riften. ArvakDG is a spectral undead horse added with the Dawnguard add-on. He can be summoned for 60 seconds, but will remain with you until you dismount even if past the time limit. You must complete the Soul Cairn Horse Quest in order to obtain the Summon Arvak spell. A fourth unique horse, Karinda, is available on PC via the Console, but does not otherwise appear in-game. Wild horses will buck until tamed. Stay mounted until they submit. If you are thrown, try again. Once tamed, you can add a saddle and rename them at any stable. When changing horses, tamed horses will return to the location where they were found. You will need to remain mounted on the horse until it is successfully tamed. It has a chance to ragdoll you when bucking, which will force you to chase down the fleeing horse once you get back on your feet. Once tamed, the horse is yours. Most wild horses will return to the original location they were found, but the Unicorn will instead return to the College of Winterhold. When mounted, allows for faster speed, except when fast-traveling. Carry weight that is independent of yours, allowing for sprinting and fast travel even when you are overencumbered. Can distract and attack enemies during combat. Allows for climbing extremely steep slopes such as mountains, and surviving some falls that would normally kill you, but instead kill your horse. Will fast travel with you to places if lost. Will count as a witness for crimes you commit in its presence. Pressing the sprint button while on a horse will allow the horse to run faster for a short time without depleting your stamina— horses have their own stamina pool. Mounted combat is enabled as of patch 1.6; you can use melee or ranged attacks on horseback, but not magic. Note that the horse's original name is permanently lost, but you can continue to click the dialogue option to randomly cycle through the above list of names. These saddle options are available to wild horses as well as base game horses like Shadowmere. The disguised bandits at Nilheim will attack and even kill your horse without provocation. See the place page for details. If your follower accidentally hits your horse in combat (or vice versa), they can become aggressive towards each other. A horse you own will wait for you where you dismount. If you leave your mount outside of a dungeon with more than one entrance, it will still be by the exit that you entered the dungeon by if you leave from an alternate exit. Fast-traveling will reunite you and your horse. If your horse is killed while you are mounted upon it, you will be thrown to the ground. This results in you being unable to attack or defend until you regain your feet, similar to the effects of being ragdolled by an Unrelenting Force shout. If you have Dawnguard installed and have learned the spell Summon Arvak, you can summon him and ride him around for at least a minute, then when you dismount him there will no longer be a horse following you. You can find an unowned horse or steal one (there are several unowned horses available on the map, and every major city has a stable where you can find a horse to steal) and fast travel with it into a major city; when the horse "goes to the stables" it actually returns to its original location. You can kill the horse you last rode (if it's an unowned horse on the map, it will respawn). Horses can catch diseases. When a horse is in combat with an animal, there is a chance that your horse will catch a disease (your horse will exude a whitish glow similar to when you catch a disease) from whatever animal he was fighting. The disease does affect the horse, although some (such as Witbane) will not have a noticeable effect. The horse from Whiterun stables, according to Skulvar, is called Queen Alfsigr. Opening the character menu while walking or galloping your horse, then closing the menu, will cause your horse to veer up to 90 degrees towards due north. If you buy a horse from Katla's Farm and the horse is killed, attempting to purchase a new horse from the same stable results in 1000 gold being deducted, and Geimund stating that your horse is "the one with the saddle." However, the saddled horse may not be available for taking, or may not be present at all. Instead, your new horse spawns at the Riften Stables. Dead horses owned by the player will respawn at the corresponding stables that sold them, even though a new horse will have been generated (and/or sold) to replace them. The dead horses (now alive), have the original Ref. Nos. and the correct name ([Player]'s Horse), but they behave as if the horses are free horses (legal to ride but will return to original position once dismounted). This bug is fixed by version 3.0.2 of the Unofficial Skyrim Legendary Edition Patch. Upon mounting your horse, your character may simply float in the air while you control the horse and your character will not follow. This may cause a crash to desktop or your console may freeze if you travel too far away from your floating self. When the horse is returned to where your character is, you can dismount as normal. Reloading your last save may fix this; if not, restart your machine. When you mount a swimming horse, the horse will move as if it is running on land. This effect lasts until you ride the horse back onto a surface it can walk on normally. Dismounting a horse while not moving may cause the horse to suddenly move from its original position while remaining on the same terrain level of the original position. In other words, the horse will fly for a brief moment before crashing down (usually falling off a cliff to its death). When in possession of the cursed Ring of Hircine, you may transform into a werewolf on your horse. If this happens you will be able to move around as a werewolf but the camera will be fixed to the horse until you turn human again and mount your horse. After dismounting, but before the camera refocuses on you, you can still control the horse. Horses can get "infinite" sprint. While sprinting on a horse, hit the wait button, then let go of the sprint button while continuing hold the left stick forward. You can go through the wait or cancel, but when you come out, the horse should sprint indefinitely so long as you continue to hold the left stick forward and avoid uneven terrain that breaks his gallop. Hard saving again at this point will make the horse always gallop via the left stick, until you dismount or cause the horse to jump. The effect will last through reloads via the hard save but not via the auto-save that occurs when waiting. ?. This page was last modified on 25 March 2019, at 01:00.